Hello everyone today we are going to add some more information to a recent post. 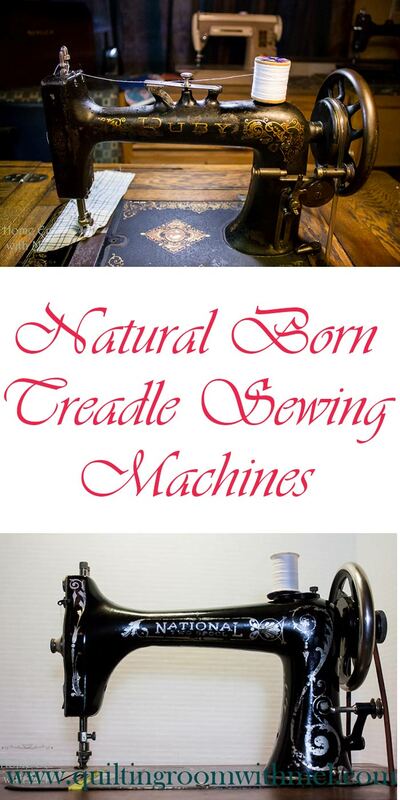 We are going to be talking more about treadle sewing machines. I will be going more in depth as we discuss the pros and cons of different models of treadles. Last time we crossed this bridge we discussed the first two machines to find their way into the Quilting Room with Mel. I will be discussing more of the particular machines that we keep in rotation. 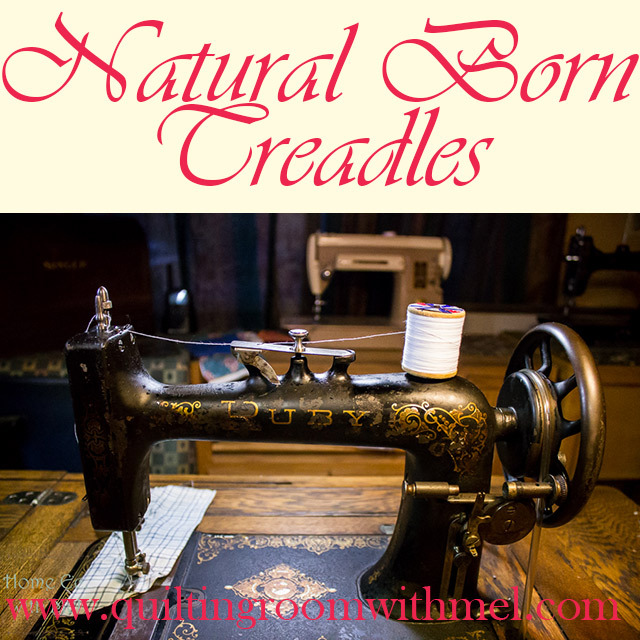 I will finish up with the natural born treadles and then we will explore some of the benefits of using a newer vintage sewing machine head in an older treadle base. And of course, we will also discuss some of the failures we have encountered along the way. Early in my treadle addiction, I happened upon a dead head only that was being used solely as an interior decorator piece of art. When the owners were packing their belongings for a job-related change of location they decided they didn’t want to drag it across the country. I picked it up for parts at a grand price of $15. Clean on the outside but dirty stuck on the inside the parts I wanted were the wrong ones so I ended up throwing it under the bench and made the parts I needed on the lathe at work. After a few months, I was looking for something to do one weekend and I decided if I could get it to move it would probably sew. The only thing I could find to identify the head was the badge name Damascus and the serial #. The harder I looked for info the more elusive it became. I did get it free and operating as smooth as silk. I had learned it was built by The National Sewing Machine Co, but that was where the information stopped. It seems it was a very limited production or a prototype. For all practical purposes, it is an IEB (Improved Eldridge model “B”). The major difference is the shape of the machine; the IEB has a square tower and a square arm whereas mine has a hexagonal tower and arm. It takes the same shuttle and it fits in the same treadle cabinet as my later to be discovered IEB. I am only bringing this sewing machine into the equation because it has served under several conditions. I used it with an improvised hand crank to sew the binding on my first quilt. 1:1 stitch ratio on a King size heavy denim quilt. TWICE because I didn’t square it up right and I like a full bodied binding, not a limp floppy edge. When I got my IEB about 3 years later I discovered it would fit into the treadle like a glove, even the odd cut outs were in the right places. So it was used in the original style cabinet until the IEB was finished and needed to move back into its treadle base. When I had it as a hand crank I had built a box to mount it in so it could be used. Now the box fits into a special (Franken) treadle table we built using Irons from a defunct New Home cabinet and an old coffee table. We can drop any belted machine in its box with an opening through the bottom into the table, pull the motor and belt out of the way and stretch a nylon belt over the machine pulley and treadle away. With this versatility, it qualifies for the favorite treadle competition. Because we have made a reference to the New Home irons it would only be fair the mention that we did not cannibalize a good machine to build a Franken treadle. We actually have a late 1800s A-3 New home that sews like a dream. It’s a VS machine, smooth as silk for its wedge designed method of raising and lowering the needle bar. I think it may leave some of the prettiest stitches ever behind its needle; I love to use this little gem because it has a slow revolution (gear) ratio making it nice for piecing tops with and great for teaching newly interested enthusiasts how to treadle. It also holds a shuttle bobbin that is almost half again as long the Nationals and our Singer 27-127s. We also have Mel’s great grandmother’s Ruby machine treadle in its cabinet. It is used only for special projects and for nostalgia purposes because it has had so many millions of miles of thread sewn through it that the needle bar bearing surface in the head of the machine is no longer round. It is elliptical or egg-shaped so badly that if it is treadled very fast the needle flops around and will hit the needle plate breaking the needle instantly. We have the parts to completely rebuild the machine but then the legacy would be weakened so we decided to leave it just the way her Great-grandmother sewed her last stitch on it. When it is treadled moderately it never misses a stitch and the stitches are perfectly in line. Although the actual stitch length does vary slightly from stitch to stitch I used it to make our youngest grandson’s receiving quilt when he was born. So it has new life in its legacy. The longer bobbin in the New Homes means we can sew longer without having to stop and change bobbins. And while it is really nice to go longer without rewinding the bobbin, none of the already mentioned machines can hold a candle to our National Two Spool machine. This particular machine has a rotary style hook but the bobbin is completely unique. It has a canister which actually holds one of the small spools of thread as a bobbin. You can sew a very long time without ever having to refill the bobbin. As far as stitch quality and needle speed I don’t see much difference between it and the Grand rotary machines. I have been told that the Two Spools would not consistently sew quality seams at a high needle speed. I don’t know for sure what would be considered too high of a needle speed for it to function. I can say that several times now I have tried to treadle faster than the machine can sew. So far it has always beaten me. Oh, needle speed, well I can say we have timed me many many times and I can consistently clock 1400 stitches a minute sustainable for 4-5 minutes at a time and can spike the clock as high as 1650 for 60-90 seconds with mine. I am sure there are others who would make these speeds look like a turtle but I’m pretty happy with them from a non-Industrial treadle. My first Singer treadle came to our home in pieces. The first piece was given to me by one of my colleagues at work. He brought me in an old Singer 27 treadle head that had been factory retrofitted with a solid hand wheel and a motor which mounted over the side inspection hole probably in the early 1930’s according to the information I could find about the mount. He had acquired it in the early 1980s and it was stuck when he got it so it lived in the barn until about 7 years ago when he challenged me to get it back on-line and sewing. It took me all one day soaking and heating with a heat gun but at the end of the day, it was making stitches. He laughed and shook his head and gave me the keys to the old Singer. The first part of the research on this machine was over the motor mount. The mount itself was unique by its means of mounting. While researching I realized this machine was a treadle only head. There are no motor mount holes on the pillar of the machine. Odd they are referred to as motor mounts when they were originally designed as a place to mount the hand crank for a portable machine. When I looked up the serial number on the Singer website I learned that the machine was commissioned for manufacture in 1895. Of course, now I was on a quest to put the old girl back into a treadle like she belonged. A year later I found a set of rust Irons at a citywide yard sale and after giving the owner my plan, my word and a promise to send her a photo of the base in action she agreed to sell me the rusty mess for $25. I took them home oiled the rust nuts and took the whole thing apart. Every single iron part of the base was scraped off and the rust was all removed with a wire brush (by hand). By doing it this way I kept the antique iron patina with no shiny white steel spots. I decided not to repaint any of it, instead, I oiled it several times and now from time to time I wipe it down with Linseed oil to stave off the rust. They are beautiful and quiet. They roll through so smooth I have to keep the needle held up with the pedal because the counter weight of the head is enough to roll the needle down. It only takes a couple times of the needle dropping on fingers to learn how to hold the pedal so the needle stays up. As for the promise I made to put the irons back under a machine and not under a coffee table or vanity. I not only sent her a photo of the finished product but also of the progress of the project and a short video of the final results. She was so happy to see it working again she tried to give me back the money. She didn’t want the Irons back she just wanted them to be loved and used. I refused her offer and her Irons are still being used under that machine. The nice thing about Singer machines is that with the exception of the back clamp 66 machines all the short shank feet will interchange. So my 1895 does a marvelous job free motion quilting with a hopping foot on it. This has just about covered the Natural born treadles here at the Quilting room with Mel. This only leaves us to cover some of the unnatural treadle combinations we have here in rotation with the herd. I think we will save that later and let it be the final segment of this discussion. So Until next time as always enjoy your machines your way and don’t tap your feet to the music when you are trying to thread a treadle machine. If you have a treadle sewing machine you are wanting to get working again we'd like to give you this handy guide for doing just that. It has a list of supplies and links so you can find all the information easily here in The Quilting Room.